After the accelerated growth of the Black Lives Matter movement, many racists across America have gone on a barnstorming campaign, posting the catch phrase White Lives Matter (WLM), to counter a message they believe is playing a part in a systematic devaluing of white culture –– even orchestrating what they call a “white genocide." Since then, the Texas-based neo-Nazi group Aryan Renaissance Society (ARS), a member of the white nationalist coalition United Aryan Front, has attempted to capitalize on this momentum by promoting WLM as “a movement dedicated to [the] promotion of the white race,” according to ARS documents. While its unclear if WLM is a group attempting to create this alleged movement, claiming to have “representatives in various states” or a pet project of ARS, members of ARS encourages sympathetic whites who want to spread the WLM message to contact ARS members. But the “white lives matter” message is not as simple as it seems. Much like the Council of Conservative Citizens (CCC), which inspired Dylann Roof to kill nine people last year in Charleston, S.C., ARS also promotes the false black-on-white crime narrative. ARS members in southeast Texas have so far taped flyers on bathroom walls, light posts and bus stops that read, “It’s Not Racist to Love your People,” including the hashtag #whitelivesmatter. But ARS has gone farther than simply handing out flyers to promote its message. The group organizes social gatherings to build a sense of camaraderie among supporters, and plans to organize a campout around Houston, Texas, next month. This ethnic state –– a pipe dream held by most white nationalists –– will be carved out within the United States. “Areas have already been earmarked in anticipation of this eventuality, such as the American Northwest and Western Canada,” ARS claims in its Ten Point Position Statement. 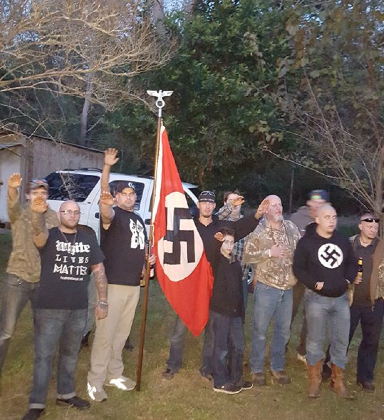 One photo from an ARS party showed Ron Price and his son giving the Nazi salute. Others include Nazi flags draped in the background. In photos from one event in August 2015, ARS members held WLM signs alongside a procession of cars driving to a public memorial service for the Harris County Deputy Darren H. Goforth, who was shot and killed in Cypress, Texas. Barnette, the Tennessee member of ARS, unsuccessfully organized a “social media” protest in August 2015 against a BLM rally in the Johnson City, Tenn. Responding to the BLM demonstration, she said, “(We) have a small army ready to blow their little party out of the water … in the proper way,” according to a Johnson City Press news article. Besides Barnette’s membership in ARS, she also describes herself as a “revolutionist” wanting to “create a new world for [white people].” Barnette has also written “Bolts to the Sky,” on her Facebook wall, a slogan predominately used by the violent Tennessee racist prison gang Aryan Nations. Editor’s Note: The Southern Poverty Law Center (SPLC) confirmed in mid-August 2016 that it is adding White Lives Matter to its 2017 hate group map and list. White Lives Matter is a white supremacist group founded by people with long histories in racist movements, as the story above explains. The group, which is dedicated to “the promotion of the white race,” claims to have representatives in several states, which the SPLC is currently investigating. A full list of White Lives Matter chapters will be released in February 2017 along with all hate groups for that calendar year.